'Arclight will keep you up all night, if you dare to stay awake.' - Pittacus Lore, author of New York Times best-seller I am Number Four. 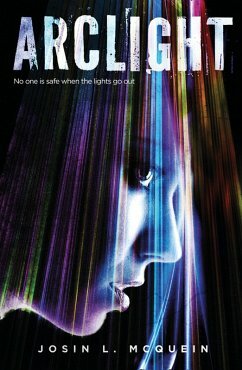 No one is safe when the lights go out – a sci-fi thriller you shouldn't read in the dark… The Arclight is the last refuge in a post-apocalyptic world consumed by terrifying monsters called the Fade. No one crosses the wall of light that keeps the last human survivors safe. There's nothing else left and nowhere to go. Or so they thought, until Marina, a lone teenage girl, stumbles out of the Dark. Marina can't remember anything about her life before that moment. Where has she come from? How has she survived? And why do the rulers of the Dark seem determined to destroy her? To find out, she will have to venture back into the Dark . . . An edgy and chilling teen thriller, perfect for fans of Veronica Roth's Divergent and Suzanne Collins' The Hunger Games. Josin L McQuein was born and raised in Texas, where she used writing as a way to escape when she needed a break from caring for ailing relatives. Now she and her three crazy dogs live in a town so small the buffalo outnumber the people, and things like subways or consistent internet access are fictional creations of the faraway fantasy-land known as civilization. Arclight is her first novel. Josin L McQuein was born and raised in Texas, where she used writing as a way to escape when she needed a break from caring for ailing relatives. Now she and her three crazy dogs live in a town so small the buffalo outnumber the people, and things like subways or consistent internet access are fictional creations of the faraway fantasy-land known as civilization. Arclight is her first novel.